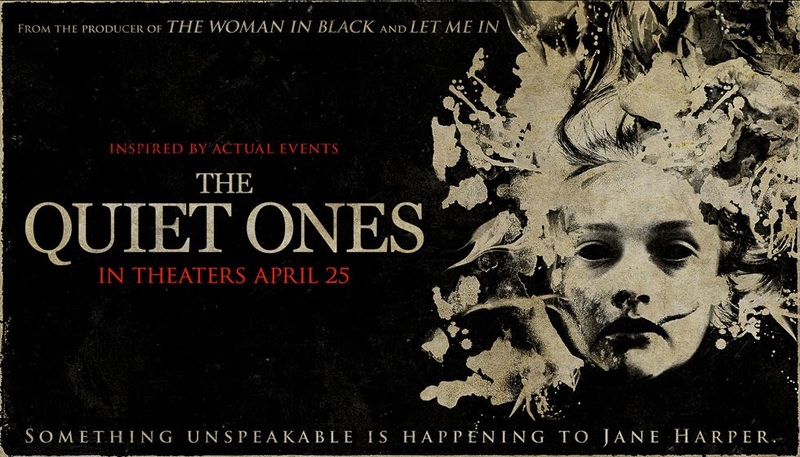 Reader Review: The Quiet Ones (2014) – Hooray For Movies!! An Oxford Professor preforms an experiment on a young woman whom he rescues from an asylum and with the help of three students tries to prove his hypothesis that supernatural occurrences are merely the manifestation of what already exists in the mind. As with all good horror movies, a tranquil ordered scene is set. Oxford University, and the calm, well-educated Professor Joseph Coupland played by Jared Harris asks his students ‘what is the supernatural?’ His ideas on the subject provoke unrest and recruits some excited and impressionable students. The professor has set up an experiment to prove his theory that the supernatural can be explained as manifestations of negative energy. His subject is Jane, who has been passed between many unnnerved foster parents and asylums who are convinced she is possessed. The professor has recruited Harry, an engineering student excited about using the latest cutting edge equipment to monitor telekinetic events and electromagnetic fields to help substantiate the professor’s theory. Also on board is Charlie, a stunning, well-spoken woman who offered herself to be the experiment but was apparently not psychotic enough. She certainly is theatrical and has some massive self-esteem issues but agreed, she doesn’t add up to your typical unhinged girl in a dirty white night dress spewing pea soup or hiding behind her curtain of dark hair. She instead takes the roles as the very attractive blond, the sexual interest and the nurse. The character who leads us through the jumps, screeches and gasps is the camera man, Brian, as he forces us to see what he does through his camera. He is a blank canvas, and unsure in his beliefs or passions and just wants a job. He is hired to document the experiment. The seemingly professional foundations for this experiment disappear as we realise there is only one apparent professional with three intrigued students in tow and your typical horror movie girl clad in a dirty white night dress and dark greasy hair with that look of innocence covering up something horrifically sinister! Oxford University cuts the funding and the five of them retreat to a large derelict house in need of a few decent light bulbs. Now we’re getting somewhere! The real thrills start here! The subtle creepy moments, well timed music and shaky camera certainly gets the heart going. As the professor pushes the boundaries, the unwavering loyalty of the students starts to crumble away and combined with the unexpected and unexplained paranormal activity unnerving the professor and undermining his hypothesis, panic and chaos takes hold. Conclusion: It is subtler than most horror movies and the gore is kept to the minimum. This for me was more about the collapse of people, their beliefs and mental sanity with Jane, on which so much hope was placed, as the quite, unknowing destroyer. Really enjoyed it.